Growing pains aren't always painful but inevitably bring complications. After a sudden growth spurt in grade school, those nice corduroy pants that fit so perfectly just a month before can suddenly make it seem like you're looking for starfish in tidal pools. Likewise, shooting upwards a couple inches in high school can make it exceedingly difficult to continue being a wallflower and blending into the background. Corporations can have any number of growing pains – ranging from subtle and insignificant to immense and course-altering. The most obvious examples of corporate growth can be found in companies that outgrow their domestic market and expand beyond borders. Of course, reasons driving such expansion are almost always sound in theory – broader customer bases create bigger revenue streams – but can come at a price. Accountants are usually on the front lines of those growing pains, knowing firsthand that a good set of financials in one country might be sorely lacking in another. One such example can be seen in the quickly approaching changes to lease accounting standards on both the international and domestic fronts. As is always the case, Embark is here to save you some eyestrain and frustration by giving you an informative but concise summary of the biggest differences between IFRS 16 and ASC 842. While the changes being brought by the IASB and FASB might appear similar at first glance – the leasing standards project even being conducted jointly between the two boards – there are some important differences that could significantly impact companies with business lines that cross borders. Lend us just a few minutes of your undivided attention for truckloads of insight that would likely occupy several more megabytes of elbow room anywhere else. We promise it will be painless. While the definitions and Day One lessee accounting standards are mostly converged between the new IASB and FASB standards, there are significant differences on Day Two and transition provisions. First and foremost, lessees will no longer classify leases between operating and finance under IFRS 16 but will continue to do so under ASC 842. For IFRS 16, the new standards take effect for annual periods beginning on or after January 1, 2019 for all entities. The FASB, however, lists an effective date for ASC 842 of December 15, 2018 for public entities and December 15, 2019 for everyone else. It should be noted that nonpublic dual reporters may decide to adopt both standards on the same day by choosing to take advantage of early adoption of the FASB standards. For IFRS 16, the full retrospective approach or modified retrospective approach with practical expedients are available. ASC 842 requires modified retrospective for all leases existing at or entered into, on, or after the beginning of the earliest comparative period presented in the financials. Dual reporters may need to start implementation of the new lease standards earlier than companies that strictly report internationally to be able to present necessary comparative information for FASB purposes. IFRS 16 allows lessees to apply recognition exemptions for leases of low-value assets. However, no such exemption exists in ASC 842 so dual reporters will have to choose whether or not to use the low-value exemption provided by international standards or to recognize them and maintain consistency with ASC 842. The new IASB standards state lessees need only apply a single on-balance sheet lease accounting model while FASB standards use a dual classification model for finance leases and operating leases. The required classification will affect measurement of right-of-use assets, lease expenses, and income statement presentation. IFRS 16 requires lessees to remeasure lease liabilities for changes in variable lease payments when such payments are based on an index or rates on the dates when contractually required cash flows change. ASC 842, however, requires no such reassessment due to adjustments to an index or rate. Therefore, dual reporters must separately track remeasurement assessments for international standards when leases are tied to an index or rate. The new international lease standards state that in instances when the seller-lessee has a substantive option to repurchase the asset, the transfer is not considered a sale. However, ASC 842 states that under similar circumstances, when the underlying asset is not real estate, the transfer may be considered a sale only under certain circumstances. If the leaseback is considered a finance lease by a seller-lessee, then recognition of a sale is automatically precluded. With right-of-use assets, only gains or losses relative to cost of the the transferred rights are recognized according to IFRS 16. However, just like any other lease, the present value of the lease payments is used to measure right-of-use assets by the new standards in ASC 842. Accordingly, gains or losses are recognized by the difference between sales proceeds and the carrying amounts of the asset in question. 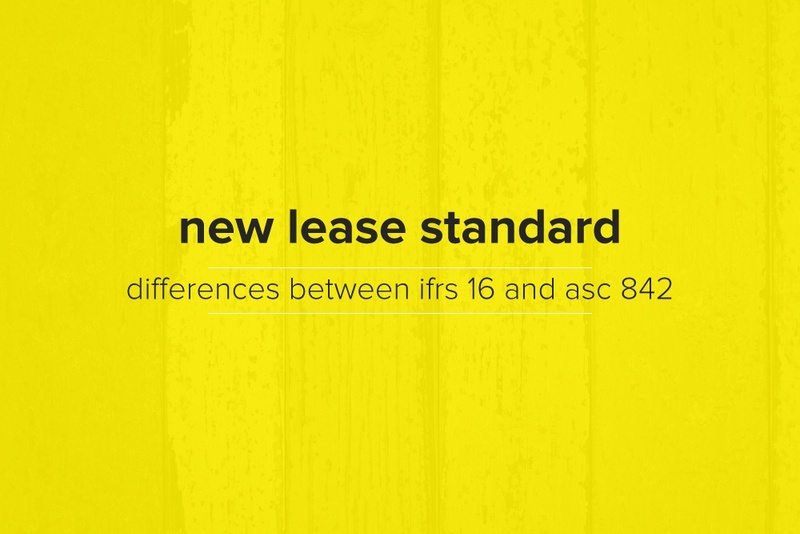 New international lease standards state that a sublessor must classify a sublease by reference to the right-of-use asset stemming from the head lease except when the recognition and measurement exemption for short-term leases is applied. By ASC 842 standards, however, sublessors classify subleases strictly by reference to the underlying asset. As you can see, dual reporters must be cognizant of the nuanced differences between the new standards. While there is some room for streamlined reporting between them under certain circumstances, Embark encourages you to spend some time analyzing the new lease standards to fully understand how they will impact your organization's reporting. And as always, we’re here to help!